Tech upgrades and more off-road focus mean this is the best Africa Twin yet. The overnight snow has thankfully disappeared and the sunshine is out, and there’s a satisfying bark from the exhaust on Honda’s new flagship as we ascend one of the many twisty mountain roads that dominate this area of southern Spain. A new model designed to sit alongside the stock Africa Twin, the Africa Twin Adventure Sports has more of an off-road bias, but also the ability to eat up miles like never before. Having enjoyed significant sales success since its re-birth in 2015, the Africa Twin has now undergone its first round of serious upgrades in a bid for improvement and to keep up with rivals. New ride-by-wire electronics not only give a boosted throttle connection that allows you to feel every beat of the 998cc parallel-twin 270o-crank motor, they have allowed the enhancement and addition of more rider aids. The original three-stage traction control now has seven stages, and you can also control the amount of engine braking too. All of these options are packaged into three rider modes: Tour, Urban and Gravel. There is a User setting, too, which lets the rider easily tailor their preference to suit their style. Honda also offer a quickshifter and auto-blipper as an aftermarket accessory. A new fuel tank is another fundamental change over the standard Africa Twin, growing from 18.8 to 24.2 litres. 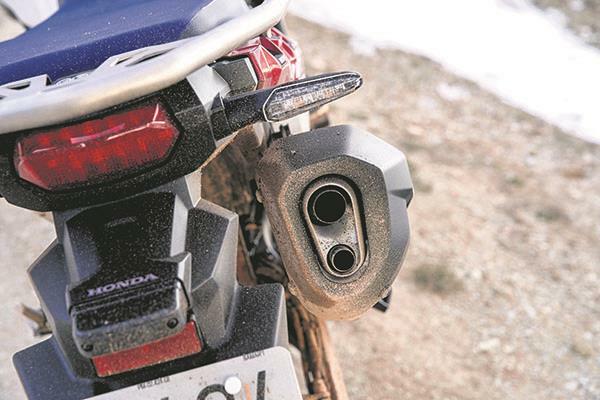 It gives the bike significantly more presence due to its extra width, and increases the range to a theoretical 300+ miles, placing the Honda firmly among the adventure bike class’s grand tourers. Of course, the bigger tank means more weight, with the Adventure Sports now topping the scales at 243kg despite a 2.3kg saving thanks to a new lithium-ion battery. But thanks to the improved suspension and the fully-adjustable 45mm Showa front forks, you don’t feel the extra mass. The new Africa Twin feels more balanced than the original bike, with the forks operating higher up in their stroke, meaning there is less dive and weight transfer when you close the throttle or hit the brakes. This makes it more fun to ride, and enables you to make brisk, easy progress on twisty roads. It’s an impressive achievement given that the new bike has an extra 22mm of suspension travel front and 20mm rear in a bid to further enhance its off-road performance. Ground clearance is up by 20mm, to 270mm. To back up the long-distance credentials of the additional fuel capacity, the ergonomics have been altered. The seat is now 50mm higher, at 920mm (but it can be lowered to 900mm), and is flatter, too, making moving around easier in a bid to fend off inevitable aches and pains should you be maximising the monster range. The handlebars are 32.5mm higher and 6.5mm closer to the rider, which means a more upright riding position and even more leverage on the wide bars. This improved position feels more neutral, and is complemented by the new 80mm-taller screen, which boosts wind protection. Disappointingly, it isn’t height adjustable, meaning that it won’t work for everyone. While the evocative exhaust note is backed up by a very linear power curve, the claimed 94bhp output remains the same as the original model’s. Ridden solo it’s an engaging experience with all its power and torque being easily accessible, yet the muscle is no match for that of its 1200cc+ BMW, KTM, Triumph and Ducati rivals, putting it instead among their smaller siblings such as the GS 850 and Tiger 800. The new dash is bigger than before, but remains compact in comparison with the many TFT flat-screen dashes that are becoming more common. There is plenty of information and it’s simple to use, with no complicated menu system to navigate. Its angle has also been adjusted to make it easier to read when stood up on the pegs. A small cover shades it from direct sunlight. Off-road, the Africa Twin has always performed well, with its soft suspension and linear power making it one of the easiest and most confidence-inspiring adventure bikes. The supple suspension and upright riding position on the Adventure Sports only improve on the original package, and despite the extra weight the newcomer feels balanced and relatively agile at slow speed while being planted and stable on fast trails. All in all, it’s a convincing package. Important upgrades make this the best Africa Twin yet. It has a quality feel with nimble handling and plush ride. Increased tank size gives greater presence as well as boosting the range, and the classy paint is striking. While it can’t match the performance and specs of the big adventure bikes, it’s a mile-munching grand tourer. Any power deficit becomes a strength in terms of usability, agility and off-road performance. So what about the standard Africa Twin? The standard £11,575 Africa Twin benefits from the same throttle and electronic upgrades, and 18.8-litre tank. It comes without the long-travel suspension and additional crash protection, so weighs 13kg less at 230kg. Ridden against the Adventure Sports, it feels lower and much narrower. As a result, it’s even easier to manoeuvre. It has the same power and torque figures, meaning that while it’s a long way off the most powerful adventure bikes in the class, it’s easy to ride. The character of the parallel- twin motor is incredibly linear, so there are no surprises as you drive hard out of corners. The new traction control is effective but becomes intrusive on the higher settings if you ride hard, but it’s so easy to change on the move that it is only ever a temporary problem. As it also saves its last-known settings, you won’t have to fiddle around with traction or power levels every time you turn off the ignition. The new dash is simple to navigate and gives plenty of easy to read information. All in all, it’s a convincing upgrade for an already-good bike.